TotalPond's 400 GPH Low Water Shut-Off Fountain Pump with Light is recommended for medium to large fountains. It features our patented Low Water Shut-Off technology that automatically senses when the water level drops. Available at The Home Depot. Relax and enjoy your fountain both day and night with our TotalPond 400 GPH Low Water Shut-Off Fountain Pump with Light. We recommend this pump for medium to large to large fountains that are located in windy, arid or hot areas. It’s also an excellent pump if you sometimes leave your pump running while you’re away. Fountain pumps fail when water levels drop. This medium-sized pump features our patented Low Water Shut-Off smart Technology that automatically senses when the water level drops. Once water is added, the pump will turn itself back on. This quiet energy efficient pump can produce fountain heights up to 7 ft. high with an adjustable water flow control. The 400 GPH Fountain Pump with Auto Shut-Off & LED Light is ideal for use in large fountains. 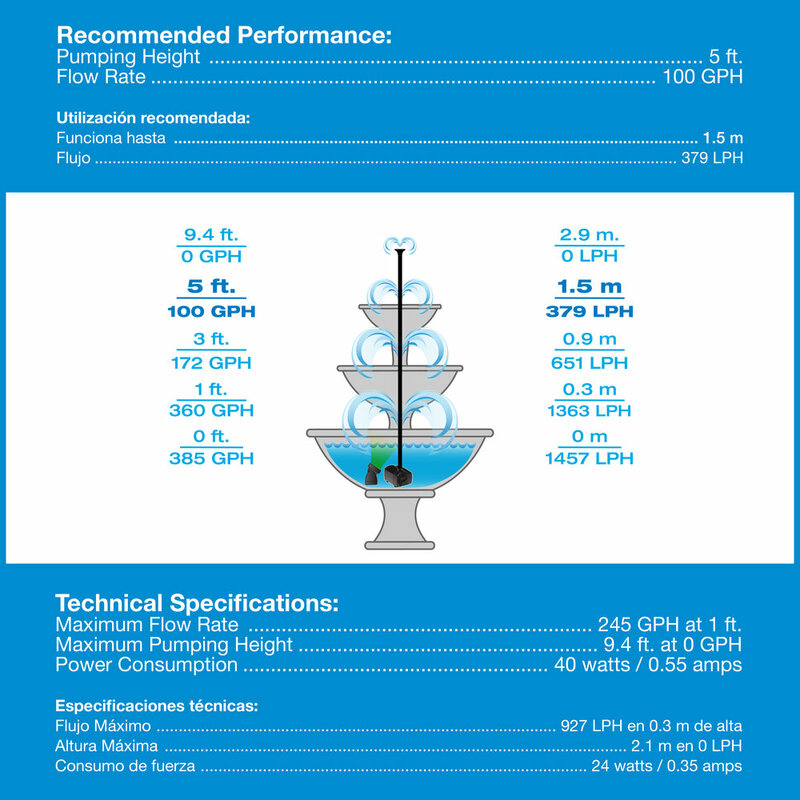 With a maximum pumping height of 9 ft., this energy-efficient pump helps power fountains with an ideal pumping height of 5 ft.
All TotalPond Fountain Pumps with Auto Shut-Off have an adjustable flow control to fine-tune the flow rate. This pump includes a 16 ft. power cord to allow for flexible installations, with 2 ft. cord for LED light. Dimensions: 4.6 x 3.3 x 2.6 in.